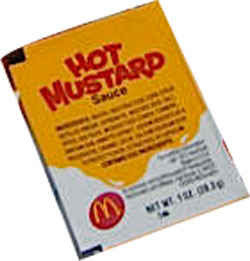 I SAW YOUR AD ON CRAIG'S LIST FOR THE MCDONALDS HOT MUSTARD SAUCE THAT IS CANCELLED IN CANADA http://toronto.en.craigslist.ca/tor/for/1047937058.html. I LOVE THIS SAUCE SO F**KING MUCH!!!!!!!!!!!!!!!!!!!!!!!!!!!!!!!! I have a recipe for the hot mustard sauce if you seriously want it! 1. Combine all ingredients in a small uncovered saucepan. Whisk until smooth. Much better than paying 25$ for something that's probably spoiled!